The young champion says he depends heavily on his Humminbird electronics and LakeMaster charts to find and catch bass all over the nation. When a kid dreams of hitting the home run that wins the World Series, then grows up and actually does it, where is “up” from there? The same question applies to Brandon Palaniuk in the world of professional bass fishing. As an 8-year old boy catching trout in his home state of Idaho, young Brandon had a very specific quest: To rise to highest ranks in B.A.S.S. and become the best-of-the-best. At the 2017 AOY Championship on Lake Mille Lacs, Palaniuk achieved his boyhood dream. His 62+ pounds of Minnesota smallmouth secured him as the points leader to make Brandon the Toyota Bassmaster Elite Series Angler of the Year. With AOY checked off his bucket list, Brandon is the first to admit that defending the title is his goal. To do so, he believes he’ll need to win at Lake Martin, Ala. in February. His game plan? Study the LakeMaster chart, find fish with his SOLIX 12s, stay on them with the Minn Kota Ultrex, and catch them one cast at a time. This entry was posted in Bass Fishing, How To on November 16, 2017 by ronniegarrison. I was about 10 years old when I saw a TV program about a Florida tourist operation with glass-bottom boats. I can remember thinking: Wouldn’t that be cool? Even then, my goal was to catch more and bigger fish, and a transparent-floored boat seemed like a good way to learn more about fish location and behavior. Now, decades later, my dream has come true. I’m fishing out of a glass-bottom boat… Okay, not literally, but outfitted with a unique combination of compatible electronics, my Ranger 620 allows me to see what’s going on below. What’s even better, the system is simple to use, but profound in what it reveals. My system starts with a Garmin 7612xsv chartplotter/sonar combo. This unit, like many offered by Garmin, features a video input option that allows me to plug in and view Aqua-Vu Multi-Vu camera. The pair works extremely well together. The 12-inch 1280 x 800 WXGA Garmin display shows what the camera captures in ultra-bright detail, even in full sunlight. It offers the option of full-screen video viewing, or I can split the screen to have video and sonar, video and mapping, etc., all with a push or two on the unit’s touch screen. Historically, the weak links with underwater cameras has been the monitor quality, a necessity to keep overall cost down, and ease of use. Although companies like Aqua-Vu are making better and brighter monitors, there are also options like the camera-only Aqua-Vu Multi-Vu that plugs directly into my 10-and 12-inch Garmin units and provides a stunningly clear, large viewing space. With the press of a couple buttons on the touch screen Garmin menu, I can go from mapping to sonar (traditional sonar, ClearVü or SideVü) or any combination of the two. I also have the option of adding underwater video to the mix. The ease of incorporating underwater viewing allows me to use the camera far more frequently. I now drop it overboard any time I’m curious, and within seconds get a look at what’s going on below the boat. I use it often for fish species verification, a huge time saver, especially when filming TV shows, pre-fishing for tournaments, or when trying to put family and friends on fish. It also helped me become a much better interpreter of the highly-detailed CHIRP sonar readings I only dreamed about a few years ago. Case Study #1: Smallies or Suckers? I was on the Great Lakes chasing giant smallmouth when I pulled up on a big reef and scanned it my SideVü. It was loaded with fish! Knowing that smallmouths will move onto reefs in late fall, I was pumped especially after catching a four-pounder on my second cast. I hooked another fish 15 minutes later and had the surprise of the trip. It was a big sucker and it had inhaled my jigging spoon! The next fish was also a sucker, as was the third, and yes, I was baffled! I had no idea that suckers will feed like aggressive predators. Looking for answers, I finally lowered the Aqua-Vu down and quickly understood what was going on. The marks I was seeing on SideVü were not smallmouth, but suckers, and the reef was crawling with them. Earlier this summer, I found a rock pile in 19 feet of water that was loaded with fish. I expected walleyes; but when I dropped the camera I discovered they were all deep-water largemouths. Later that same day, I found additional schools of fish I was convinced were crappies. Again, I dropped the camera and was proved wrong; they were big bluegills. I was taping an episode of “Lake Commandos” on a lake that DNR survey data indicated had lots of largemouth, but very few smallmouth. So I was surprised when we landed several smallmouth along a weedline that should have held largies. So I dropped the camera to the bottom and discovered a huge pile of boulders in the middle of the grass and it was filthy with smallmouth! This was information I couldn’t get from my sonar because thick weeds had overgrown the entire spot. Many natural lakes have progressively become more diverse in terms of vegetation types. Thousands across the country are now weed-choked with indigenous and invasive vegetation. On many lakes, weedlines extend for hundreds or even thousands of yards. This makes breaking down the lake difficult and time-consuming, particularly when fish are relating to specific weed types. On a recent “Lake Commandos” shoot with BASS touring pro Adrian Avena, the key to the entire big bass bite came down to finding cabbage, which was difficult as it was available only in small, random, isolated patches. As soon as we found a patch, however, we’d land two or three 4- to 6- pound bass on jigs tipped with Berkley Chigger Craws. But you could work 400-600 yards of a weedline between cabbage patches. Sonar definition has really improved over the years, to the point that it is making it possible to breakdown some weed types with sonar. Milfoil, for example, looks different on screen than cabbage… if you know what to look for. By running sonar side-by-side with video, I’ve learned to recognize how various weed types appear on sonar. The lessons continue, and it’s not full-proof, but I find myself able to find grass like coontail and cabbage that usually holds fish and avoid those that typically don’t. This information is so valuable that I am now investing time simply to compare what I am seeing on sonar with the camera. In the process, I am becoming more efficient at finding fish. One other thing about grass, and I am embarrassed to admit this: in some cases, particularly in areas with current, isolated patches of soft-stalked grass like milfoil, will lay horizontal to the bottom. On sonar, these areas can look like a school of four to five fish (and I thought they were). My sonar/camera system is also invaluable for confirming bottom composition and clarifying what my sonar is telling me. In many situations, with sonar alone, I was left wondering: Is that rock or thick coontail clumps on bottom. Hard bottom or soft? A bottom transition from one to the other? Now I understand what that looks like on sonar and can validate it 100% of the time with camera, which is critical. Bottom hardness transition areas are underwater super-highways for countless fish species. Studying bottom composition has led to some interesting discoveries, too. I’ve spotted lost anchors, sunglasses, lures and rods on the bottom of lakes, as well a surprising number of golf balls. But what the sonar/underwater combination reveals is much more than just fun… it’s also incredibly educational. I find myself dedicating days to leaving the rods in the locker and studying specific structure. Why is this specific spot holding fish? I’ll study spots for awhile, make mental notes, and drop waypoints, and this is putting more fish in the boat. Steve Pennaz is a hall of fame angler who excels at finding and catching fish on new waters, a skill developed over 30 years of extensive travel in search of giant fish. His television series, Lake Commandos, Man vs. Lake vs. Man, helps anglers understand the steps to building successful patterns on the water. This entry was posted in How To on November 29, 2016 by ronniegarrison. MADISON, Wis. – Warming temperatures throughout Wisconsin this week should make for a great bite when the general inland fishing season gets underway on Saturday, May 7. DNR southern fisheries supervisor David Rowe holds a northern pike netted during a musky survey on Lake Monona in Dane County. Lake Wissota, a 6,300 acre impoundment of the Chippewa River, is well known for its trophy musky. However, the catfish fishery has been gaining popularity and during the spring 2016 fisheries survey, flathead catfish over 20 pounds were a frequent occurrence with flatheads over 40 pounds not uncommon – including this one held by fisheries technician Matt Andre. DNR fisheries biologist Joseph Gerbyshak holds two 7-plus pound walleyes from Long Lake in northern Chippewa County. The lake’s walleye population is rebounding according to recent fisheries survey data and now totals 3.6 adult walleye per acre, up from 2.9 adult walleye per acre four years ago. Justine Hasz, fisheries director for the Wisconsin Department of Natural Resources, said spring survey work on lakes and rivers around Wisconsin indicates healthy fish populations and great opportunities for anglers based on the walleye, bass, northern pike, panfish, trout, muskies and even catfish netted and promptly released by fisheries crew members in recent days. While fishing is a passion for many, it is also an economic driver for the state, with an estimated 1.2 million anglers producing a $2.3 billion economic impact, according to the American Sportfishing Association. That impact becomes clear as tens of thousands of anglers take to Wisconsin’s 15,000 lakes, rivers and 13,000 miles of trout streams for opening day. Walleye continue to be an important target for anglers and since 2013, the Wisconsin Walleye Initiative has worked to rebuild and enhance walleye populations throughout the state. The fish that have been stocked should reach legal size over the next two to three years although some anglers have reported increased catch and release activity from the young fish. In 2015, Wisconsin stocked 760,000 extended growth walleyes, eclipsing the 2014 record of 720,000. For 2016, DNR intends to stock some 827,000 of the six to eight inch fingerlings, including some 229,000 fish from private and tribal fish farms and 598,000 from DNR hatcheries. The trout population continues to make gains throughout the state and this year anglers will find 14 streams with upgraded classifications as well as 27 that for the first time have been documented as sustaining trout populations. Six of the newly classified streams have earned the coveted Class 1 designation. Anglers targeting panfish also will find new, experimental bag limits to optimize panfish size on high potential lakes capable of producing large panfish. On these lakes, identified in the fishing regulations book, daily bag limits reflect efforts to limit harvest during spawning season or prevent overharvest of any one species. Buying a license is easy and convenient through the new Go Wild licensing system, with online access available 24-7. Visit GoWild.wi.gov, one of more than 1,000 vendor locations or a DNR service center to purchase licenses. While the GoWild licensing system allows several new ways to display proof of your license purchase including use of a personal conservation card, authenticated driver’s license and pdf display on mobile devices, anglers fishing in boundary waters must use the paper printouts as law enforcement officials in the surrounding states do not have access to the Wisconsin database. 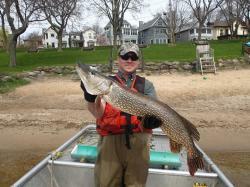 Wisconsin residents and nonresidents 16 years old or older need a fishing license to fish in any waters of the state. Residents born before Jan. 1, 1927, do not need a license and resident members of the U.S. Armed Forces on active duty are entitled to obtain a free fishing license when on furlough or leave. Anglers can buy a one-day fishing license that allows them to take someone out to try fishing, and if they like it, the purchase price of that one-day license will be credited toward purchase of an annual license. The one day license is $8 for residents and $10 for nonresidents. Anglers can find fish species information, boat access sites, shore fishing areas, lake information and regulations by downloading the free Wisconsin Fish & Wildlife mobile app, which includes a full array of fishing information. DNR has tackle loaner sites in 50 locations, including many state parks, making it easy for people to enjoy fishing if they don’t have their own equipment or if they left it at home. This entry was posted in Conservation, How To, Where To Fish on May 10, 2016 by ronniegarrison.